When you travel, sometimes the benefit of leaving your home is your destination might have better weather. It rained the first night I arrived in Toronto. It was grey, cloudy, and rainy every single day I was there. On the last day, it was also windy like a hurricane. When my plane touched down in Vancouver last night, raindrops immediately coated the windows. It continued to rain today. It’s times like this I think back to when I went to sunny San Diego not a year ago. I have arrived back home from my cousin’s wedding in Toronto. I had a lovely time in Canada’s most populous city and quite enjoyed all the wedding festivities. As always, it’s great to see family. As many of you know, there are some exceptional weather conditions plaguing the east coast of North America right now and I was quite concerned that my flight this evening was going to be delayed considerably or even cancelled outright. I checked the status of my flight before leaving for the airport and everything seemed alright. When I arrived at Pearson International, I soon found out that many others were not so lucky. Most, if not all, flights to the northeastern parts of the US were cancelled. It was only until boarding time did a wrinkle appear in my travel plans. We were late in boarding because our gate was being used by another flight that was delayed in leaving. Once that plane left, our plane could then finally take its place at the gate. The flight next to us was in even more dire straits. Their plane was at the gate and ready to go but their crew was delayed getting into Toronto and the airline was scrambling to get a replacement crew onto the plane. Imagine a gate full of passengers and a plane readied and fully fueled but no crew to operate the plane. Lucky for my flight, our crew was ready to go and everyone boarded quite quickly. We then unfortunately had to sit at the gate for another thirty minutes. Apparently Transport Canada requires some maintenance check for every aircraft before a flight. A plane cannot leave without it. With the craziness of the day, the maintenance crews were way behind schedule so we had to wait for some dudes to come around to our plane to do a walk-around inspection. We wound up leaving an hour after scheduled departure time which sucked. The rest of the flight passed without incident. I suppose I should consider myself fortunate in that I was able to leave Toronto at all. In fact, our plane was scheduled to take another set of passengers back to Toronto this evening but that flight was cancelled. As we left the gate, I could see a line of those passengers waiting to talk to an airline employee about what they could do instead. I am happy to be home and am in need of a good night of sleep! Apologies to my loyal readers for not writing a post last night. I was in a major rush to pack for my trip to Toronto where a cousin of mine is getting married. i didn’t start packing until I got home from work and my flight out was less than 12 hours later. I have arrived in Toronto now. This is the first time I have come back to Canada’s most populous city since 1987, when I was just a very young child. Though I am only here until Monday evening, I am hoping to see much more of the city compared to my last trip. So most people don’t know, for a software engineer who has used technology for most, if not all his life, I’m pretty behind in some areas. For example, prior to my trip to Montreal in June, I owned and used only one set of earbud headphones which I originally bought sometime around 2005. This old and beat up pair of buds used to get tangled in my messenger bag all the time. I could put them in my bag and take them out literally a second later and they’d be all tangled to hell. I suppose I could have meticulously wrapped them up and tied the ends so that they couldn’t get tangled but who has the time for that? So I was just resigned to the fact that they would get tangled no matter what and I’d have to spend a minute each time to get them untangled. Then in June, I was heading to Montreal for a wedding. At the airport, while I was waiting for my flight, I discovered I had forgotten to bring my headphones. Not wanting to buy the crappy onboard headphones, I decided to buy a pair from one of the many stores at the boarding gates. It had probably been seven years since I had purchased a pair of earbud headphones. When I got the stupid clamshell plastic packaging off, I noticed something different about these buds. There was a plastic guide piece that you could slide up and down the wires. When you slid the piece up towards the buds, it kept the two individual wires from separating and thus causing all the tangling in the first place. So when you store the headphones, the piece is all the way up. 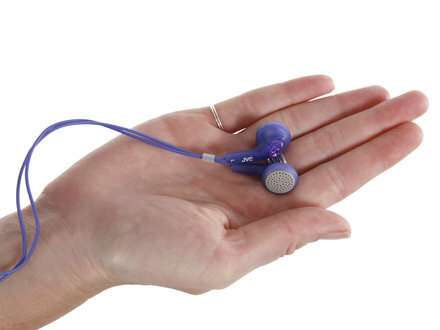 When you’re listening with them, you slide the piece down so the wires can separate. You can see this magical piece of plastic in the photo above. If you could have seen my face on the flight, you probably thought I was on my first airplane because I had this goofy look on my face, marveling at the fact that we, as a race, had solved the tangled headphone problem. I don’t know how long ago we solved this problem but I believe that marked a major milestone in our history. I am beginning to wonder what other problems we have solved that I don’t know about. I had to shave my face tonight because my facial hair was getting unruly. Unlike most manly men, I grow a pretty weak beard because my facial hair doesn’t come in very densely. It grows in isolated patches so it looks terrible once it gets too long. Unfortunately for me, I had to leave my upper lip area when it came to shaving off this mess. On the weekend, I think I must have irritated that area when I went to shave it on Friday night. It got worse when I went outside and exposed it to the cold winds we had recently. It’s weird because my actual upper lip isn’t irritated, just the skin above it. So rather than make it worse by raking a blade over that area, I left it alone. The problem is, I now have this stupidly weak looking moustache. If you Google image search “child molester moustache” you’ll see something very similar to what I’m sporting right now. The proper thing would be to take a picture and show it on here but there’s no way I’m doing that. This thing is embarrassing. I can only hope this skin irritation goes away so I can shave it all off. I subscribe to a YouTube channel run by a user named MAKAVELI719696. I did so originally because he has the best highlight packages of Vancouver Canucks games. With the hockey lockout in full effect, he’s using his editing skills in other forms of media. The above is his take on the 3rd Presidential debate between President Obama and Governor Romney. At around 8pm, I crawled into bed and took what turned out to be a two-hour nap. It’s now well after midnight and I am super refreshed and awake. I also feel quite mentally sharp as well. For someone who normally struggles to fall asleep under regular circumstances, it will be an even tougher endeavour to get to sleep tonight. It’s possible to I might take a sleeping pill. In other news, someone Googled my name tonight and then found my blog. They went to the “about” section, as if they weren’t sure who I was. They then searched my blog using the term “video games”. Hey, whoever you are, if you want entertainment from my blog, you’ll wanna be searching “wang flies“. So I went downstairs this evening to get my mail. It was after 11pm. One of the things in my mailbox was a flyer for a supermarket. I usually just toss those away and this flyer was no different. Except that when I went to drop it into the recycle bin in the mail room, I saw a photo of a meat special for the week. In that photo was a perfectly cooked steak cut so you could see the inside. The steak pink and tender looking, not overcooked, just the right blend of medium rare that I oh so love. It kinda looked like this. I didn’t really have that much to eat for dinner this evening so seeing that meat really made me want to eat a steak. Of course, I had no raw meat upstairs, let alone a steak. I suppose I could have run into Safeway before close and grabbed a steak. Though with a proper marinate and then cooking, it would have been well after midnight before I’d be chomping on steak. I decided against that. Now that I’m writing about this, I’m thinking about steak again. Man, maybe I shoulda made some steak. This is probably my favourite segment from the show Scare Tactics, a hidden camera show that tries to horrify its victims. As you can tell by that one dude that essentially smiles through the whole thing (terrible acting man! ), some of those people were in on the scheme.